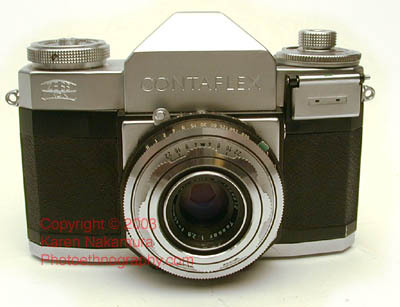 The Contaflex II is a leaf-shuttered 35mm single-lens reflex camera made by Zeiss-Ikon in West German between 1954-58.The camera uses a fixed 45mm f/2.8 Carl Zeiss Tessar lens. Using the text or images on this website without permission on an ebay auction or any other site is a violation of federal law. 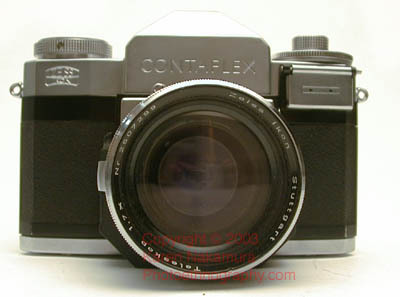 I also own a Contaflex IV, which is a more interesting camera to me as my IV actually works. 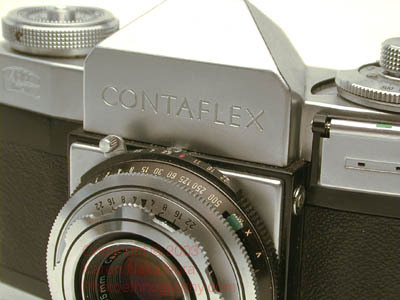 I bought this Contaflex II "as is" which meant that the shutter diaphragm was broken. The mirror goes up and down and it looks like the camera is taking photos, but in actuality the leaf shutter is not moving. If you'd like to purchase this camera for parts or display, please let me know. The camera itself is in very clean condition as you can see. You may be able to get the shutter working again, but I can't promise it. The asking price is US$50 + shipping. This does not include the Teleskop attachment below, ask about that separately. The mirror is non-auto-return. This means that when you release the shutter, the mirror flips up, the view screen goes black and remains that way. I think this is why you see these cameras going for much less than they should - most people think they're broken! Because the Contaflex series uses the Synchro-Compur leaf shutter, it can flash-synchronize at all speeds up to its maximum of 1/500. 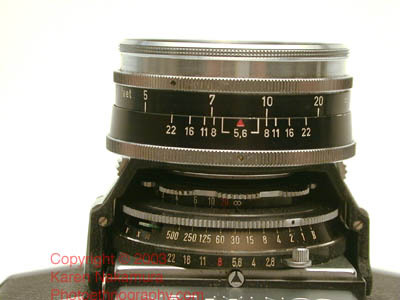 The German engineers thoughtfully put a steel protective cap on the selenium meter, but unfortunately on this unit the meter is long dead..
On the original Contaflex I/II series cameras, the lens was fixed in place, unlike the later III/IV series in which you could remove the front element. In order to provide for telephoto capabilities, Zeiss designed the Teleskop add on lenses. The Teleskop provides for 1.7x magnification, which turns the 45mm into a 76mm lens. The Teleskop lens screws into a mounting bracket (sold separately; batteries not included), which slides into grooves on the Contaflex II body. The mounting bracket is only compatible with the Contaflex I and II. You focus with the Teleskop attachment. For more info on the attachments possible, see the Pacific Rim Camera Contaflex I/II accessory page. V - X - M switch for "V-Self-timer" "X-electronic flash" and "M-bulb flash"
Selenium cell mounted on top left of camera body, protected by a flip-up metal cap. Full manual exposure. Measure EV values from lightmeter then transfer EVs to lens body. No cold flash mount on pentaprism but this can be bought as an after-market item. Last modified: Thursday, 11-Mar-2010 01:12:37 EST , [an error occurred while processing this directive] .